Physical characteristics: A peregrine falcon's body is designed for speed, and it is the fastest, most skillful bird of prey on Earth. It also has remarkable eyesight and hearing. The birds are between 13.4 and 19.7 inches (34 and 50 centimeters) long from their beaks to the end of their tails. The female usually weighs about twice as much as her mate. Peregrines have dark feathers on their upper parts and lighter-colored feathers below, with streaks on their under parts. Geographic range: Peregrine falcons most likely breed in more places in the world than any other bird. They are found on all continents except the Antarctic and on many ocean islands. in deserts and forests, and on the treeless tundra. They also live among skyscrapers in large cities. Diet: Peregrine falcons are famous for the way they catch birds in mid air. A peregrine flies high until it sees a bird flying below. 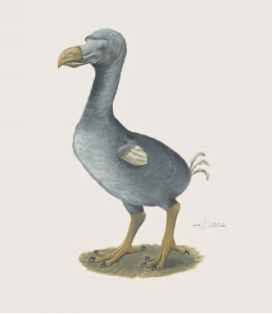 Instantly, it folds its pointed wings and dives steeply down, hitting and killing the bird at more than 100 miles (160 kilometers) per hour. Then the peregrine either catches the dead bird, or it dives past the bird and picks it up on the ground. 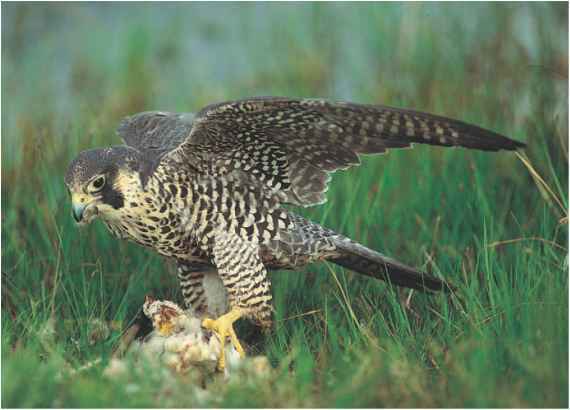 Peregrines occasionally hunt on the ground and eat mammals, reptiles, insects, and fish. Behavior and reproduction: They usually build their nests on cliff ledges or in caves. They also nest on window ledges and bridges. Peregrines lay between two and four eggs, and the chicks are able to fly when they are just five or six weeks old. Peregrine falcons and people: People working in skyscrapers enjoy watching the wild peregrines that now nest in big cities. The birds are also trained by falconers to kill animals and leave them for their owners. Bailey, Jill. The Secret World of Falcons. Austin, TX: Steck-Vaughn publishers, 2002. Elphick, Chris, John B. Dunning, Jr., and David Allen Sibley. National Audubon Society: The Sibley Guide to Birdlife and Behavior. New York: Alfred A. Knopf, 2000. Jenkins, Priscilla Belz. Falcons Nest on Skyscrapers. New York: HarperCollins Publishers, 1996. Laubach, Christyna, Rene Laubach, and Charles W. G. Smith. Raptor! A Kid's Guide to Birds of Prey. North Adams, MA: Storey Books, 2003. "Falcon Comeback." Science World (April 2000): 9. Miller, Claire. "New Birds on the Block (Peregrine Falcons)." Ranger Rick (June 1993): 4-11. "Monitoring Effort Helps Northeast Falcons Rebound." National Wildlife (April/May 2002): 61-62. Rideout, Joanne. "The Urban Falcon." E Magazine: The Environmental Magazine (March/April 2001): 19-20. Wexo, John Bonnett. "Birds of Prey." Zoobooks (February 2001): 1-18. "About Falcons." The Hawk Conservancy Trust. http://www.hawk-conservancy.org/priorfalcons.shtml (accessed on May 20, 2004). "Caracaras and Falcons." Arizona Sonora Desert Museum, ASDM Press. http://www.desertmuseum.org/books/nhsd_caracaras_falcons.html (accessed on May 20, 2004). Tarski, Christine. "Everything About Caracaras." Birding. About http:// birding.about.com/od/birdscaracaras/ (accessed on May 20, 2004).